When Wayne Gallman announced he would be returning to Clemson next season, the happiest player on the Tigers roster may have been quarterback Deshaun Watson. With both players returning to campus following their 45-40 loss to Alabama in the National Title game, the Clemson backfield looks to be strong in 2016. What’s not to like about Gallman’s game? In 2015 ACC coaches named him first-team All-ACC as he accounted for 46% of Clemson’s rushing and 20% of its total offense. Numbers like that, with Watson returning as one of the early Heisman frontrunners and the Tigers should be a pre-season top 10 school again. Gallman wasn’t the only key player in college football to announce he would return to school in 2016. Mississippi’s Chad Kelly said he would return to school as well. The leader of the Rebels offense will be without Laquon Treadwell, who is foregoing his senior season to turn pro. The Rebels will also be without Robert Nkemdiche, a defensive tackle and Laremy Tunsil, a huge left tackle. Tunsil could be the first overall pick in the NFL Draft. If you are looking for a defensive star who could have made a huge junior season into a huge NFL payday, Florida State’s DeMarcus Walker could have been that player. The defensive end had 10.5 sacks and 15.5 tackles for a loss this past season. Walker should be a preseason All-American candidate for the Seminoles. The College Football Playoff committee welcomes four new voting members to its party. Per multiple websites, the new additions are three former coaches (Southern Miss’ Jeff Bower, Michigan’s Lloyd Carr and Central Michigan’s Herb Deromedi) and one current athletic director (Oregon’s Rob Mullens). They replace Mike Gould, Pat Haden, Tom Osborne and Mike Tranghese, whose two-year terms ended after this past season. What this means to the selection process is unknown at this time. The selection committee got it right this past season, having chosen the top schools from the ACC, SEC, Big Ten and Big 12. The only Power 5 conference left out was the Pac 12. The new members could mean a different pattern of voting for the upcoming 2016 season. Just because you are drafted first overall in the NFL Draft does not mean you are destined for greatness. Looking at the four quarterbacks in the AFC and NFC Title games and you see what I am talking about. College football is well represented in terms of star power. Cam Newton of Carolina and Carson Palmer of USC both won Heisman Trophies. Along with Peyton Manning, the three of them were the first pick in their draft classes. Then there is Tom Brady, who went to Michigan and was the 199th player chosen in the 2000 NFL Draft. Last time I checked, Brady had bested all of them with four Super Bowl rings. Manning has one and Palmer and Newton will compete against each other to try and get their first in Super Bowl 50. 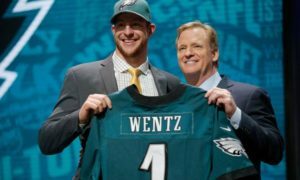 When the Senior Bowl practices begin this coming week, watch the attention paid to Carson Wentz. 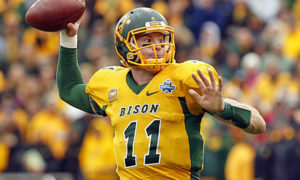 The senior quarterback from North Dakota State will be coached by the staff from the Dallas Cowboys. 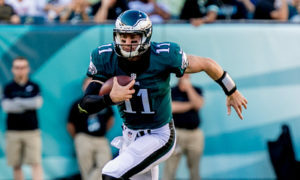 Wentz is a potential first round draft pick and it just so happens Dallas needs to start thinking of a replacement for Tony Romo, who is 36 and has been injured the past few seasons. Dan Parr of NFL.com wrote that Owner Jerry Jones has said he’s open to using the team’s top pick, No. 4 overall, on an heir apparent for Romo. The Cowboys will coach the North team while the Jacksonville Jaguars staff will coach the South squad.